In previouspost we discussed about BAM adapter and how to integrate Oracle SOA Suite and BAM using BAM adapter. 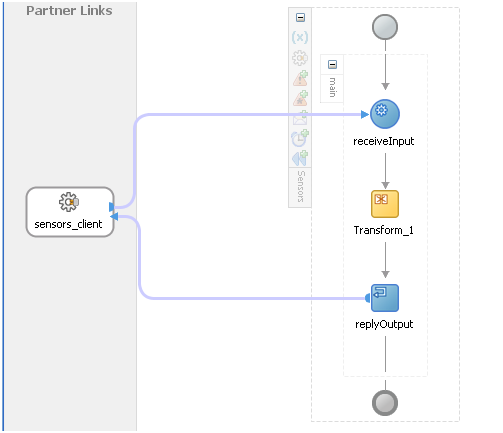 In this post, we will discuss about BPEL sensor and sensor action and will see how we can use sensor and sensor actions inside BPEL to send data to BAM. There are some prerequisites that we need to fulfill. We created one BPEL process, for that we will create sensor and sensor actions. Below is the synchronous BPEL. To add the required sensor and sensor actions you need to click on Monitor tab. Right Click on Transform and create a new sensor. Give any name to sensor. Set evaluation time to “Completion”. Then click on green button to add variable. You can see you choose any option from drop down. Now we need to specify the variable from that we will fetch the values. Select output variable. 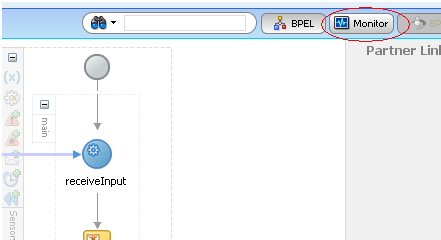 Click OK button that will add sensor to your BPEL. Now we are done with Sensor creation, our next step will be sensor action creation. To create sensor action click on Structure that will open one panel. You will be able to see “Test Sensor” in that which we created in previous step. To add sensor action right click on “Sensor Actions” Folder. We will get two options “Sensor Action” and “BAM Sensor Action”. We will discuss both one by one. Let’s first discuss about “Bam Sensor Action”. 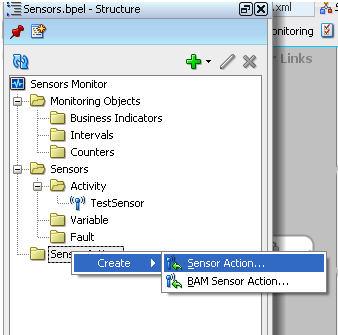 BAM sensor action is used we directly want to send data to BAM data object. First Take “BAM Sensor Action”. This will open one pop-up. Give any name to sensor action. Select Data object to that we need to connect. For this you need to have BAM Connection. Now select the operation “upsert”. It will show all the fields that are there in Data object. Choose one key field. And click on add transform button (green button). Map the values in transform. Now we have sensor and sensor action. Now deploy the composite on server and run that. You will able to see the values inside that data object. Now we will discuss “Sensor Action”. 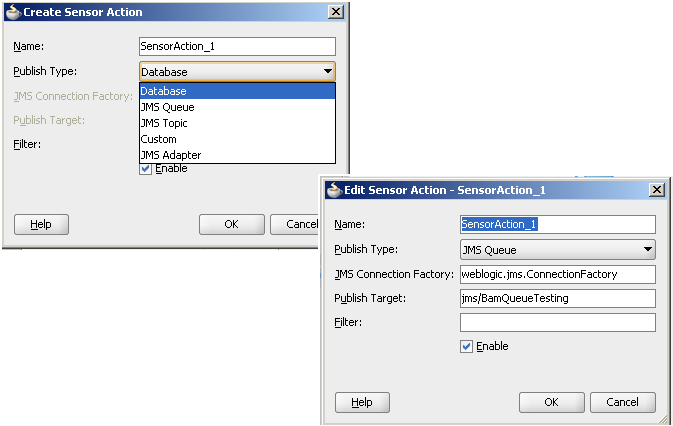 Sensor action is used when we want to send data from BPEL to either JMS Queue, Database etc and then do the configuration in BAM to fetch that data from respective publish type. From Publish Type choose JMS Queue. Fill all the details for that queue.